The Run for the Warriors race is in its 4th year and I've participated over the last two years. 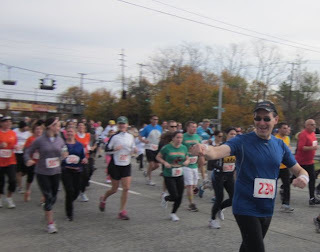 Last year I ran it in 56:23, which (at that time) was my fastest 10K to date. I had low expectations for today's race because I have not been running well this past month. Due to that, my weekly distance has dropped about 30% since the end of September. I'm pleased to report that I beat my performance expectations handily today. I'm not sure why, but I'm happy that I did. This race is all about those who serve in the military and the families that support them. There's a strong patriotic theme overlaying all the proceedings and the event feels both festive and serious. The organizers did a great job, as they did last year, and they corrected a few things from the 2010 race that made it a better experience. First, there were twice as many Port-O-Potti's to handle the 2,000+ crowd than there were last year. People appreciated that. Secondly, the 10K race started before the 5K this year. That prevented much of the congestion we experienced last year, caused by the side by side walkers who blocked runners that started behind them. It was still crowded at the start with just the 10K runners, but it was much better this year. 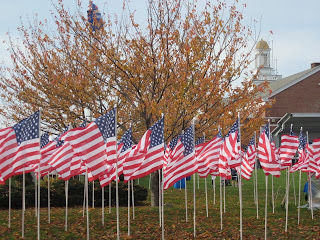 Like last year, the pre-race program involved the acknowledgment of the soldiers who serve in the armed forces and the local service people who'd lost their lives in battle. It was an emotional scene with family members that lost loved ones running in their honor. The race started at 9:30 AM and that caught me by surprise because the website said the 10K start would happpen at 9:45. Luckily, my daughter was paying attention and she rushed me to the line just minutes before the starting gun sounded. Suddenly we were off and I was was about to discover whether I had the fitness to compete today. I had taken a GU Roctane gel twenty minutes prior to the start and I felt good as we began to move. We all started slowly due to the crowd. That was fine with me because my original plan was to start slow and pick up speed if I felt I could maintain a faster pace. 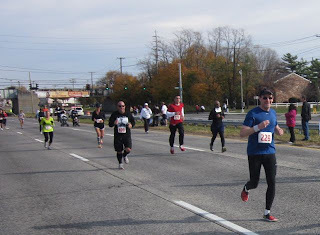 By the time we reached the off-ramp on Sunrise Highway, leading to Wellwood Avenue, I knew that I had enough in reserve to get through the race. 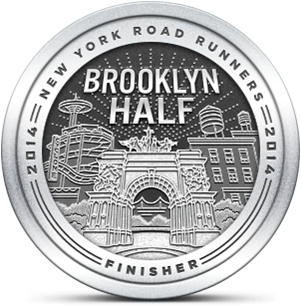 My original goal was to run this race under 62 minutes and I thought I had a good shot at that. The course is flat and probably more downhill than uphill. I passed a fair number of people on Wellwood, but I also got passed by more than a few. There were two soldiers doing the entire race on their hands and feet and that looked really hard. I felt badly for them but they were doing it in symbolic solidarity with their overseas compatriots. We passed the first mile and I saw that I was pacing at 9:02 and worried that I was going too fast that early in the race. I felt good so I maintained that pace and, before I knew it, we had taken the left onto E. Hoffman Ave. This road parallels the LIRR tracks and it had been resurfaced since last year's race. The smooth blacktop was an excellent surface to follow and at the 2 mile point I was cruising. I really felt like I was floating. I managed to catch up to a few runners and pass them and I kept encountering a group of soldiers who were running together in line, stopping every mile to do a series of push-ups. Must be great to be in that shape. When we turned north onto Great East Neck Road that intersects with Route 109, I had another Roctane gel. I didn't really need it then, but I wanted some extra energy for the remaining three miles. I took some water to wash it down and, when we hit 109, I was feeling well fueled. I'd come through the 5K point at around 28 minutes and was looking for the 4 mile marker along the northern road. By this time I started to think I might finish with a decent time. The following minutes were unremarkable and I wondered if I'd already passed 4 miles when my Garmin chirped. I was amazed to see I'd just passed five miles! I saw the sign for the exit onto Sunrise Highway that confirmed that I was on my last mile. I was running well but the off ramp had a long steep rise and I felt some strain for the first time in the race. Before long we were heading down the ramp onto Sunrise and race volunteer yelled "Almost there, just a half a mile to go!" As always, that last half mile seemed longer than it should, but when I saw the big flag and the crowds along the road I kicked into finish mode. About 100 feet prior to the line, my wife and kids stood cheering and this gave me the impetus to push even harder at the end. The clock said 56:05 when I finished, but my net was 13 seconds less. No big deal. Either way I was just north of the 9:00 mark but my goal prior to the race was to stay below 10:00. I made that goal for sure and felt very strong after the race. I guess my conditioning was better than I'd judged it to be. It was great surprise to run this race that I almost skipped because I thought I wasn't ready to do it. I give my wife credit for convincing me to run the race regardless of my performance. Next weekend is the Long Beach Turkey Trot, another 10K. I'll go into that with greater expectations but, like today, I'll run my race based on how I'm feeling and see how it goes. Yay for Lauren!! Oh, and you too : ) You can't beat floating. I was astounded to actually be enjoying a race I thought I'd be struggling to get through. Thanks for your support as well! Great race!! Perhaps your lightened work-load over the past month contributed to your time. Just a thought. Thanks Adam. There may be something to that. I do think the two days rest prior to the race helped greatly. Belated Congrats! Been behind in checking the blog. Sounds like you ran a good race and for a great cause. Thanks Bill. It was a great race. I'm hoping for another great one this weekend!